The movie is aided by an unbelievably strong and star-studded cast. Seriously, this is a who’s-who of popular actors from the 90’s (although not restricted to that decade, obviously). De Niro frequently shares screen time with his group of thieves, which includes Val Kilmer, Tom Sizemore, Danny Trejo and Kevin Gage. There are also small, but important, roles from Jon Voight, William Fichtner and Dennis Haysbert. Even a very young Natalie Portman is in this movie. Each of these characters has a fleshed-out storyline to make the viewer care about them, and that is impressive even with the movie’s extended running time. And yeah, about that length. It took me a while to get around to this movie due to its prolonged running time. This is a long crime saga, and you have to be prepared to sit down for the full three hours to get through it. Is it worth watching all the way through? Yes, absolutely! While there are a number of subplots weaving in and out of the main storyline (some that probably could have been omitted), this is still very much an exceptional film due to excellent acting, a strong script and some downright badass scenes. There are two scenes in particular that everyone talks about whenever Heat is brought up. One is the bank heist/shootout, an elongated gun battle that is quite possibly one of the best firefights ever recorded in film. The other is a sit-down scene where Pacino and De Niro have a cup of coffee, the very first time the actors have appeared together on screen. Much was made of this encounter when the movie came out, and it is still interesting to see it today. Both scenes are phenomenal, albeit in very different ways. Some will cry that Mann went overboard with this movie, trying to cram too many stories into one film. 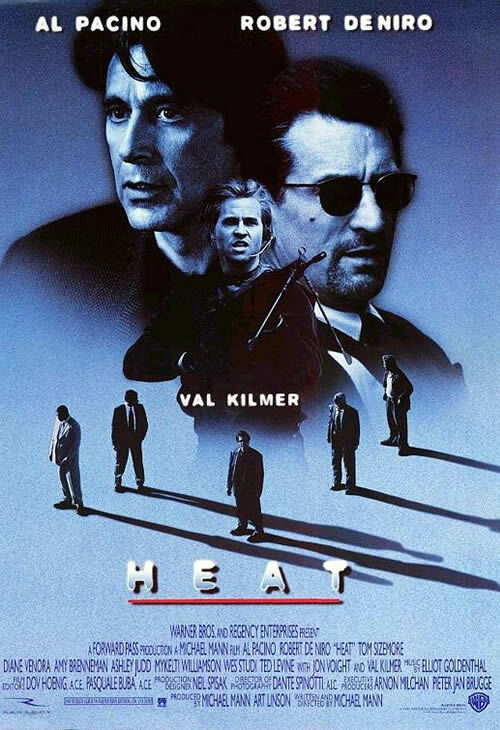 I agree that a little probably could have been trimmed off the top, but I still very much enjoyed Heat. This is one of the best crime sagas that I have seen, and its frequent praise is well-deserved. A little too long in my book, but that ending, and diner scene with De Niro and Pacion, were perfect. It’s just a shame that the next film they starred in had to be Righteous Kill. Like wtf was up with that movie!!?!?! You’re right — the ending was excellent. I haven’t seen Righteous Kill, but I don’t think I have heard a single good thing about it. I will probably end up watching it some day just to see how bad it is though.